This is a full newsletter with a lot of important information! We are excited to be presenting our first Spring Concert conducted by Mr. Cos Natola hosted in the Parish Hall. Please note that the concert has been moved from the gym to the Parish Hall. All students are expected to attend and perform at this event. Students are to come to the evening in full uniform. The concert starts at 6:30pm with students meeting in the classroom at 6:15pm. We expect this concert to last 1 hour. It will be a great night of students sharing their musical talents. We can’t wait to see you there! The Legion of Mary will be once again hosting the “Crowning of Mary” on Sunday, May 28th at St. Bernadette Parish at 2:00pm. There will be a procession and stations of Mysteries of the Rosary on the parish grounds to be followed by “flower offerings” and “Crowning of Mary” inside the church. They are extending their invitation to the school families, along with a special invitation to young girls and boys to be “flower girls” and “angels” and they can wear their fine clothing. 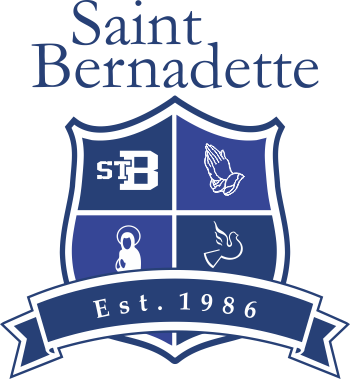 Please support the Legion of Mary as they are very strong supporters of St. Bernadette School. Our school choir is nearing the end of their performances and practices for the school year. We are in need of 2 parents to help Mr. Roy during choir practice. If we do not get the help, unfortunately choir & practices will have to be cancelled. Please contact the office if you are able to assist. As you may have noticed, the winter snow and ice has caused some significant damage to the asphalt in our play area and parking lot. This Friday, April 28th, pavers will be fixing these damaged areas starting at 1:30pm. It would be helpful to have as few cars as possible in the lot at that time. This Spring we are selling beautiful, locally grown plants to help raise money for Canadian Catholic Development and Peace. Plants are a great way enjoy nature and beautify your surroundings. We encourage you to buy these plants and sell them to your friends and neighbours. Get out into the garden while choosing to support a worthwhile cause. We hope that you will see something you like and help support our cause by placing an order below. Please note that the order and payment deadline is Friday, May 12, 2017. For more information please go to https://stbernadette.growingsmilesfundraising.com/home to visit our fundraising website. The signed consent forms must be returned to the school for each child to participate in the walkathon. Children who do not bring in their forms will not be permitted to leave the school grounds. We are excited to once again have the presence of the RCMP along for the walk! The fundraising committee will be collecting pledges for Fr.Paul and Fr.Jimmy this weekend in the parish gathering room after all masses this weekend (April 22 and April 23). Please consider sponsoring them as they will be walking with us this year! There are volunteer opportunities posted on OnVolunteers. We hope you are able to come out and help set up and participate in this event! Mother’s Day Tea will be on Thursday, May 11th from 10:00am-11:00am. There will be our morning Mass led by the Grades 1 & 4. Following Mass, we will gather in the parish hall for light refreshments. Our Students will perform to entertain our guests. Notices have been sent home so we can prepare in advance. Please return the form back to the school at your earliest convenience. If any Dad’s would like to volunteer for that morning with setting up, preparing & clean-up, please contact Mrs. Fraser, grade2@stbernadette.ca or 604-596-1101 . Each year at the beginning of May, comic book stores around the world offer a selection of free comic books to its customers. This is another great avenue to get young people interested in reading. It is important that parents accompany their child(ren) as there might be some comics that are not suitable for young children. This year the date is Saturday May 6th, 2017. Your child brought home his/her mite box on Ash Wednesday. It is a long time custom to invite students to make a Lenten sacrifice for vocations and it continues to be encouraged through the distribution of mite boxes to each child during the Lenten season. The purpose of this activity is not financial but SPIRITUAL. We are asking that all mite boxes be returned to school after Easter and no later than Friday, April 28th. The city of Surrey will be installing a new water main on 65B Ave. The will involve road work in the area for roughly a month. We ask for your patience and courtesy towards the workers during this time. If you have any questions or concerns please contact Mr. van der Pauw through the office.